HomeProductsNativities & Christmas MusicalsLights, Camel, Action! Lights, camel, action! Join the jam-packed cast of nativity celebrities as they celebrate Jesus' birth with a dazzling dance show. A marvellous variety of 7 songs and spectacular dancing, including 'how to' videos, but always… strictly the nativity! Available with Words on Screen™ v2. It's glitzy, it's spectacularly sparkly and it's the nativity with glamour and sequins! From the author of best-selling nativities Baubles! and Hey Ewe! The Bethlehem Broadcasting Company is recording a dazzling dance show to celebrate the special occasion of Jesus’ birth and the cast is jam-packed with nativity celebrities. Personalities, including some funky camels and a disco star, have come together again to recall their roles in the miraculous story. It’s a Christmas celebration like never before, with dance styles ranging from tango to line dancing and ballet to disco. The judges have gathered their scorecards, dancers are waiting in the wings and the audience is assembled for Lights, Camel, Action! Great fun – a marvellous variety of songs and spectacular dancing, but always… strictly the nativity! splitting the three innkeepers’ lines between six children, although Innkeeper 1 needs to take all of the lines on page 16. For increasing the number of non-speaking parts, have as many townspeople, angels, shepherds, sheep, backing singers and innkeepers as you like. having just two angels, four shepherds and four sheep. These parts would need to double up as the Star, 6 backing singers and 3 innkeepers. Teach Primary Review:It's glitzy, it's spectacularly sparkly and it's the nativity with glamour and sequins! Absolutely loved watching my son’s school perform this play in Year 4. Fantastic energy, great songs and music...plenty of roles for all the children. Loved it! Excellent production! Great that it pointed to Jesus. Children engaged since moment one, parents and staff completely amazed by the high level of the songs, script and performances. One of the best Christmas plays ever written for this age group. Such an exciting Christmas musical! The children absolutely loved rehearsing the catchy songs, the lively dances and the strong story line! A great success! Best production we've done for many years! 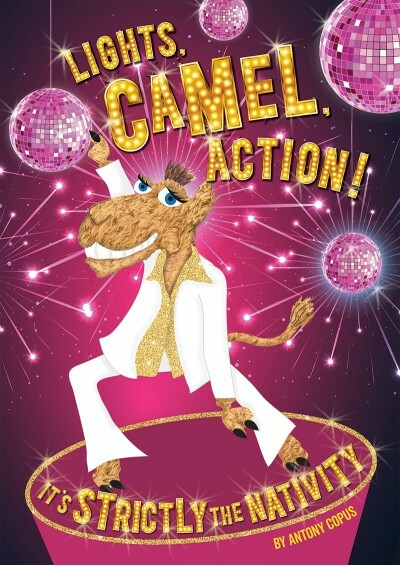 I'm a teacher at Tebay Primary School, I'm just writing tell you that teachers, children and parents loved your production - Lights, Camel Action. The combination of singing and dancing was enjoyed by all! It was the best production that we have done for many years. I don't think you do requests, but I would love another production with both singing and dancing for next year! I have my fingers crossed. New, fresh and fun! The children loved learning both the songs and the dance routines. The parents and carers were blown away with the performance, with many rating it the best Christmas production ever. Perhaps just one word of caution: we put this on as a Key Stage 1 production and if you are thinking likewise, be aware that some of the speaking parts are very large. Make sure that you have children who are able to rise to the challenge. Luckily, I do - in spades! Really entertaining... strictly come dancing meets nativity play... very funny, great for audience participation, good message and kids really enjoyed performing it - even year 5&6... Very much recommend this to others! Our children and parents absolutely loved this play! We received standing ovations and to be honest, we're wondering how on earth we top it next year! "It's glitzy, it's spectacularly sparkly and it's the nativity with glamour and sequins!"